If you want to be successful in business, you have to understand what your client wants. They probably want more than just one thing, but the thing at the top of the list is the thing you need to pay attention to. So when people say, “I can’t afford it,” what they mean is that something else is a higher priority than whatever they think you're offering them. People are pretty good at finding a way to afford the thing at the top of their list. "I can't afford it" is almost always about priorities rather than resources. 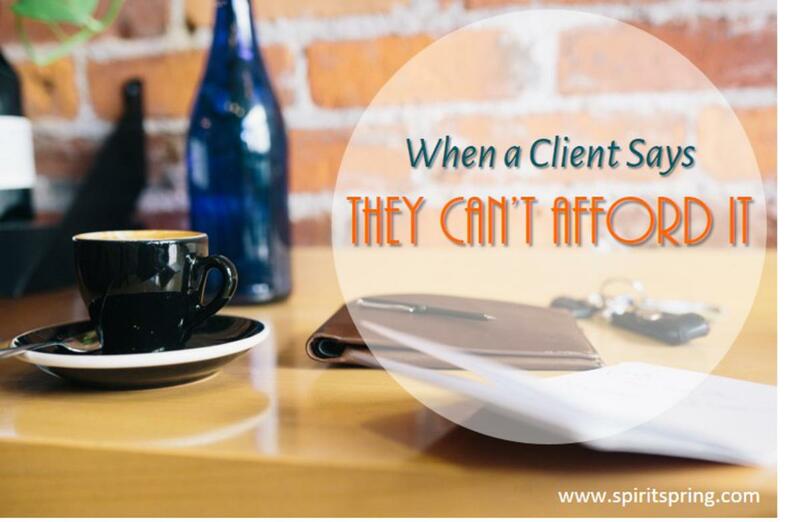 If your client says, “I can’t afford it,” don’t argue with them. 1) Am I attracting the right clients? First of all, check to make sure you’re going after the people who are most likely to want what you do. If you offered to set me up with a lawn mowing service this summer, I’d say I can’t afford it. I bought a new lawn mower recently and I have an able-bodied young person hanging around my house. So even though I have the money to pay for a lawn service, it feels like a waste of money. Wasting money is what I can’t afford. Now, I might perk up if you offered me a weekend at the beach. I can afford that, even though it would probably cost more than three month's of lawn service. It doesn’t matter how well you “sell” your lawn service to me – I’m saving my money for the beach. 2) Am I sending the right message? If you want to attract top shelf clients, you need to speak their language. Don't use low-budget language to sell high-end services. Words like “fast,” “easy,” “affordable” and “discount” attract customers who are price sensitive. High-value clients respond to confidence, quality and service. They also appreciate a good deal, but you shouldn’t focus only on that aspect if you want to win their business. Words like “expert,” “specializing,” “custom” and “guaranteed” convey high-value appeal. 3) Am I selling the right thing? Are you selling inputs rather than outcomes? Time, materials and effort are all inputs. In fact, the coaching process itself is an input. How you do what you do (i.e., input) is not the first thing to talk about; that comes later (if and when the client asks "How are you going to give me this fantastic outcome you're talking abou?") Focus on the outcome first so the client can see that it'll be worth it. Don’t make price a selling point. Perhaps most importantly, when you hear “I can’t afford it,” don't assume you have to lower your price to stay competitive. You can see where that’s going to end up, right? Instead of trying to compete on price, find a way to differentiate based on the value you provide. What’s it worth to the client to have the results they want? What will it cost them if they get those results? Be ready to prove how your signature solution is a better option than a more generic solutions. Differentiation is where the true value is. You don’t have to cringe when a prospect says “I can’t afford it” and you don’t have to try and persuade them to change their mind about it, either. Instead, focus on the value of the outcome you're promising and how your signature approach provides a unique advantage. Need a fresh perspective on what's "signature" about your coaching? Book a free 30-minute brainstorming session with me. I won't try to sell you anything, I promise! Click here for more info.